In recent years SQUID based measuring systems have been successfully introduced into geophysical exploration community. Both groundbased EM receivers as well as airborne full tensor magnetic gradiometer systems have received increased levels of attention fostered by the findings of major ore deposits with SQUIDs. Ultimate sensitivity and highest dynamic range are amongst the most prominent advantages over conventional sensors. It translates into higher depths of exploration, shorter duration of measuring campaigns and completely new types of information. 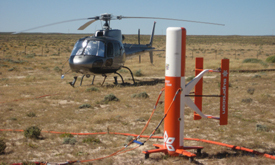 IPHT and Supracon jointly develop geophysical measuring systems for the application in natural resources exploration, archaeology and the evaluation of building ground. SQUID systems are being applied in medical diagnostics to detect and analyse very weak local magnetic fields originating from living organisms and organs. The method delivers functional and tomographic recordings with the highest temporal and very good spatial resolution for instance from human heart acitivity. 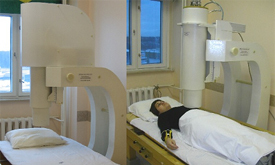 The method operates non-invasively without touching the body and is without risk and pain for the patient. Functional Heart Tomography is on the brink of clinical application and acceptance within the medical community. Supracon and its partner network support this promising application. SQUIDs are the sensors of choice whenever measuring tasks require ultimate sensitivity. Supracon supports a highly diverse range of research and development applications of SQUIDs. 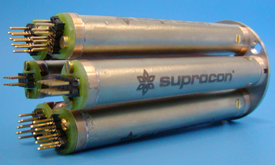 Custom tailored SQUID systems, sub-systems or components are developed and manufactured at Supracon. In addition Supracon can contribute to a successful project realisation by the help of its expertise and experiences in SQUID based measurements as well as with a close-knit network of expert partners. Supracon can act as a subcontractor or cooperation partner in such projects. 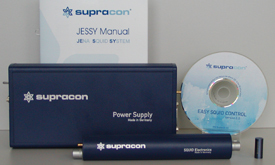 For education purposes such as in practical training in the University Supracon offers an easily controlled SQUID system. It may help understanding practical use of superconductivity, training the operation of measuring devices, and introducing the use of cooling liquids.